If you are looking for the app which is related to the management of your passwords then PassVult is perfect for this. This is really classic anti-cloud password manager which is simple plus user-friendly. Through this, a user can get ownership regarding accessing your data on iPhone. It is the simplest method of protecting your data. While using this app, all your data will be localized on an individual iDevice and now you are in control of your password data. So in another language you can say it is password manager. Moving further, the app is having a lot of the user-friendly features. These features are as follow. All your data will be protected and will not be travel from one device to another device. You will get one master key to prevent your saved password from being stolen. Managing of passwords will be easy with protection. In case if you forget your any password then simply open your app and you will get it. I use this app and now I’m happy as in case if I forget any password I easily get the data from this app. I am not worry about my data as I have full ownership for this. Remember that, you need to remember the PassVult password as you will not be allowed to reset the password if you forget the same. If you delete the app, your data will also be deleted because there is no backup feature. 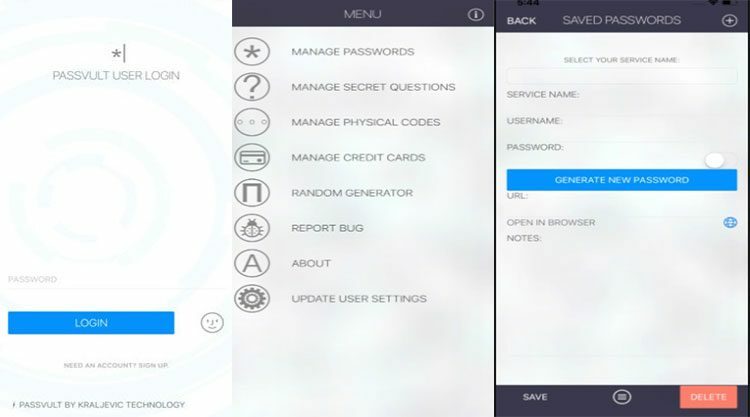 There is another free version of this app named as PassVult Lite with the core functionality of saving only passwords. Price and availability: The price of this app is $2.99 and it is available only on Apple store for iOS. There is also a free version of this app named as PassVult Lite but that contains feature of storing only password. PassVult is for everyone. Use this app in making your password management easy. It’s very useful platform that can give protection wall to your data. Thanks for reading.